Hospital-level care doesn't negate the importance of physical activity. In the past, complete bed rest was thought to be the best treatment for managing patients after physical trauma, surgery, and/or illness. Although some conditions, such as fractures, require local immobilization to heal, often, physician orders to stay in bed are not based on medical necessity. In these cases, prolonged bed rest leads to unnecessary declines in function. The complications of prolonged bed rest include muscle weakness and atrophy, contractures, disuse osteoporosis, decreased cardiac reserve, orthostatic hypotension, venous thromboembolism, glucose intolerance, pneumonia, constipation, and delirium. Despite evidence showing bed rest treatment to be largely ineffective, low patient mobility continues to persist in the acute care setting. 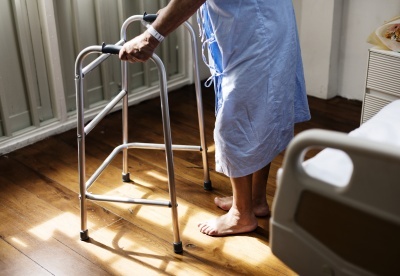 Particularly in older adults and the critically ill, low mobility during hospitalization has been associated with functional decline, new institutionalization, and death. These risks support the need to make physical activity a pillar of acute care management. During hospitalization, many factors influence physical activity. Common barriers include surgery, medical treatments, and the patient's illness. Among health care providers, a culture of immobility often exists. This culture is characterized by a fear of falls, unnecessary bed rest orders, and a lack of perceived time and staff. Nursing personnel cite fear of self-injury, insufficient training, deferral of responsibility, and the expectation of increased workload as added barriers. Moreover, inactivity is reinforced by patient and family beliefs that bed rest is vital to recovery. Removing barriers to physical activity is a multidisciplinary effort. On the part of physicians, it requires a critical examination of activity orders and a commitment to minimizing baseless bed rest prescriptions. Frequent nurse-physician communication and high patient interaction put beside nurses in an ideal position to challenge inappropriate bed rest orders, advocate for the removal of unnecessary lines (ex. foley catheters), and help patients move at their highest, yet safe level of function. In patients requiring physical rehabilitation, physical and occupational therapists are experts in using therapeutic exercise, self-care activities, and mobilization techniques to maximize functional independence. Moreover, both disciplines possess the professional background to train and support nurses who lack the skills and/or confidence to help patients get out of bed. The application of these recommendations has taken on various forms. Within physical therapy, therapists are involved in the rehabilitation of patients across a variety of acute specialty services, including neurology, plastics, burns, trauma, general medicine, surgery, oncology, critical care, and cardiology. Early mobilization in the intensive care unit is of particular interest as a growing number of studies show that even the sickest of patients can safely participate and benefit from physical activity. In addition, many hospitals have successfully implemented therapy and/or nursing driven mobility programs to enhance patient care on wards. Positive outcomes include improved maintenance of functional status, greater likelihood of being discharged home, and decreased length of stay. Depending on the patient's illness or injury complex, and co-morbidities, additional restrictions and/or contraindications to exercise therapy may apply. The Academy of Acute Care Physical Therapy offers this resource to help physical therapists identify critical laboratory values, a common contraindication to exercise. Although the document is based on best available evidence, standards regarding critical values and contraindications to physical therapy vary widely across institutions and patient populations. Consequently, the decision to defer or proceed with exercise therapy should be made within the context of the patient's clinical picture and the policies of the treating institution. ↑ Allen C, Glasziou P, Del Mar C. Bed rest: a potentially harmful treatment needing more careful evaluation. Lancet 1999; 354(9186): 1229-1233.